Ex Hussar Hindsight was the final exercise for 307 (South Nottinghamshire Hussars) Battery Royal Artillery before the battery was disbanded, and took place in Normandy in May 2014. 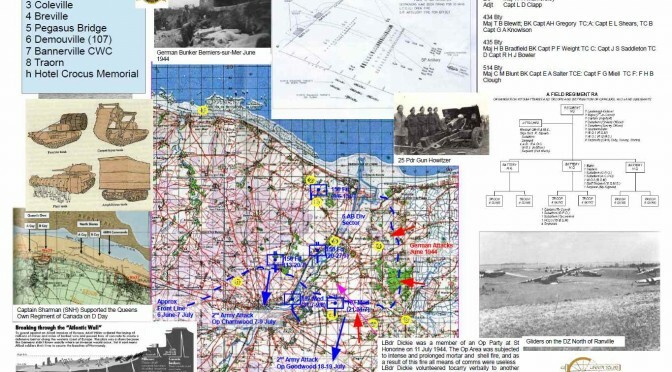 It’s an example of how a battlefield study focusing on the story of a specific unit can cover many aspects of the Normandy battles than might be expected, while focusing on the ethos and heritage of the unit itself. Practice in the estimate and orders process, etc. Extract the lessons from operations in Normandy relevent to sustained operations, the “realities of war” and the significance of the core values of the British Army. Appreciation of the SNH Ethos and an the human dimension to the battery’s military heritage. The study started with a long drive from Nottingham on Friday returning on Sunday which allowed a day and a morning for visits to the battlefields. What follows is a sample of battles and incidents in the Normandy campaign in which the South Notts Hussars took part. The 107th (South Nottinghamshire Hussars) Field Regiment Royal Artillery a territorial artillery unit from Nottinghamshire, best known for the desperate battle fought at “Knightsbridge” the nickname for a desolate piece of desert in Libya. On the 6th June 1942 the battery, unsupported by infantry or armour fought to the last gun and man against the Afrika Korps. The story of the gallantry of these men in their doomed action has been captured in books and on canvas. However, that was not the end of the story. The title and cap badge of the “South Notts Hussars”(SNH) was adopted by the 107th Medium Regiment (107 Med Regt) and 150th Field Regiment RA,(150 Fd Regt) which also received a trickle of survivors from the battle and some escapees from prisoner of war cages. SATURDAY MORNING – 150 FD REGT AND THE D DAY BEACH AREA Two years to the day after the destruction of the Regiment, members of the SNH landed in Normandy and played their part in the defeat of the German armies. Although neither unit landed on D Day, individual soldiers and officers from both SNH units served as additional FOO parties, which did land on D Day with the airborne forces and assault troops. The allies had a huge advantage in fire-power over the Germans, in the form of artillery, naval gunfire and aircraft. However, this fire-power could only be brought to bear if controlled by a forward observer. The scale of the airborne and seaborne invasion on D-Day meant that many more artillery observers would be needed for D-Day itself and shortly afterwards. Captain Sharman from 150 Fd Regt trained as a Combined Operations Forward Bombardment Observation Officer and took part in the amphibious landing on Juno Beach supporting the Queens Own Regiment of Canada on D Day with fire from HMS Kempenfeld. (Stand 1. in the map above) The assault on Bernieres-Sur-Mer was quite costly and Sharman found it difficult to keep himself and his radio set fully under cover from enemy fire. This was a good place for the battery to discuss the options facing the protagonists and practice military decision making. The 6th Airborne Division, with a key role on the Eastern Flank of the beachhead had only one RA Regiment, one third of the proportion within an infantry division. Additional artillery OP parties were dropped by parachute or glider to provide the airborne troops with artillery support from artillery units landed by sea. LT Hastings also from the 150 Fd Regt SNH was one of these observers. At one point in the campaign these two officers met at the top of Ranville Church tower. Capt Sharman spotting ships while Lt Hastings, wearing his red beret, was observing artillery fire. These were not the only SNH soldiers to take part. Gunner John Woolmore of 107 Medium Regiment is recorded on the Bayeux memorial to the missing as killed on the 6th June 1944, the first member of the South Notts Hussars to be lost in the Normandy campaign. Presumably he was a member of a similar party, and either lost at sea or in the inundated ground. It took part in the defensive fires which stopped the German attacks mounted between the 9-12th June. 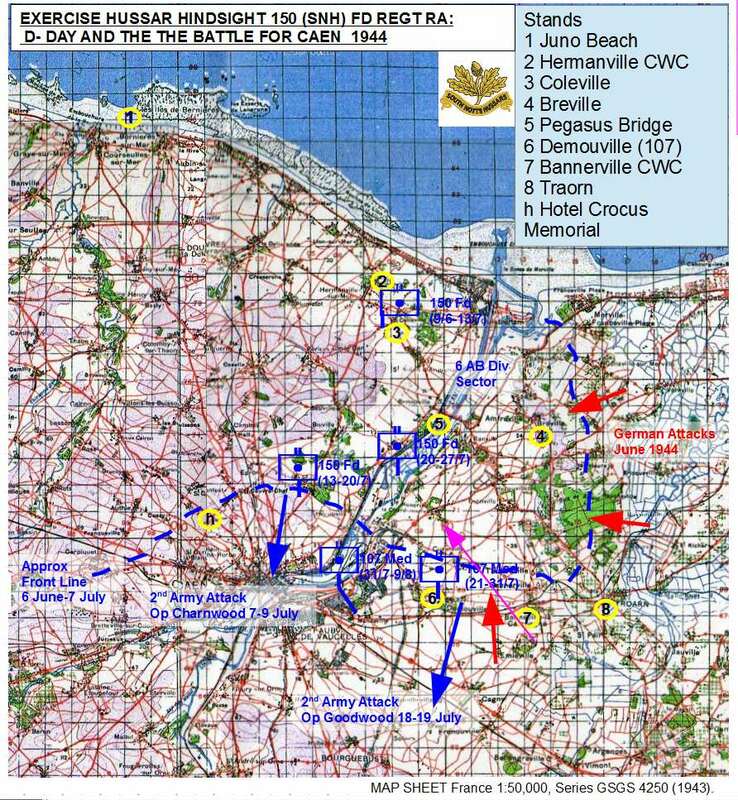 During the 24 hour period from 12 June 1944, 150 Field Regt fired 7,828 rounds, starting with Fire plan “Arrow” that supported the attack by 12 Para which seized Breville. This is regarded as the turning point, after which the airborne bridgehead east of the River Orne was never seriously threatened. The battle of Breville is suitable for a TEWT and to explore the realities of war. After this 150 Field Regiment settled into a static routine, supporting the programme of raids undertaken by the paras and commandos, a counter mortar campaign and several fire plans supporting the other formations of 1st British Corps The Gun position was subject to occasional artillery fire and regular night time bombing from the Luftwaffe. The evidence of this is in the Hermanville CWGC Cemetery, on the edge of the next village. (Stand 2) Lt Davey, an Assistant CPO was killed by bomb fragments of an anti personnel bomb which hit his command post on 9th June 1944, the first night the Regiment deployed. Other problems facing them were the mosquitoes and the flies which fed on the bloated corpses of animals and humans. This was a good place for the battery to explore the implications of sustained operations. The OP Parties took part in the raids and shared the dangers of the infantry. The second SNH grave in Hermanville is of Bdr Nelson, the BC’s assistance who died of wounds received when a shell burst over his and the BC’s heads on 14th June. One of the more hazardous jobs in the Regiment was that of the OP Signaller, responsible for maintaining line and radio communications – even under fire. LBdr Dickie was a member of an OP Party at St Honorine on 11 July 1944, in support of an attack by 51 Highland Division. (Shown with the purple arrow) The OP Area was subjected to intense and prolonged mortar and shell fire, and as a result of this fire all means of communications were useless. LBdr Dickie volunteered to carry an urgent request to fire in support of our own troops to another Arty OP. He successfully crossed 250 yards of open ground under very heavy fire to deliver the messages. The artillery support thus obtained undoubtedly did much to relieve the heavy enemy fire. For this, Lbdr Dickie was awarded the Military Medal. The 107th (South Notts Hussars) Medium Regiment was given the title and number of the 107th RHA destroyed near Knightsbridge. It was a medium Regiment of 18 x 5.5” guns formed into two batteries 425 and 426 batteries. The latter was commanded by Major W F Barber who had commanded the original 426 battery pre war, been captured at Knightsbridge, but made a dramatic escape from Italy. The Regiment landed in Normandy in July as part of 9 AGRA. By 21 July the Regiment had been deployed to Demouville SE of Caen. (Stand 6 in the Battle for Caen Map) This was a low lying, unhealthy, much shelled and bombed location in a salient further forwards than medium guns were usually deployed. From this area the Regiment supported the 2 Canadian Corps in its attacks south from Caen to Falaise. It took part in the fire plan to support the innovative Operations Totalise and Tractable as part of 9 AGRA. These assaults used heavy bombers by night and day to try to support deep attacks by Armours, mechanised and motorised troops into the German defences. The use of heavy bombers carried a high risk of “friendly fire” and the War Diary of 9 AGRA notes that action by a pilot from B/Flight 662 AOP Sqn managed to prevent US Bombers from bombing 107 Med Regiment. On 14th August as part of Operation Tractable 107th Med Regt was under command 4th Canadian Armoured Division. The plan was to was to attack with phalanxes of armour, accompanied by infantry mounted in carriers and APCs and supported by engineer vehicles through a smoke screen, to enable the armour to penetrate the German defences, supported by a fire plan of artillery fire and bombing by medium and heavy bombers. (Stand 2 in Road to Falaise Map) The operations between Caen and Falaise offer a very different terrain and tactical setting to that of the D Day beaches and a place to explore mechanised operations..
OP Parties were mounted in Sherman OP tanks, which were modified for use as OP vehicles by removing the main armament to fit a map table and the replacement disguised with a rubber barrel. Capt Turner was travelling with the HQ of 4th Canadian Armoured Brigade when it came under fire from anti tank guns. His was one of several knocked out. Turner was wounded in the arm and bailed out. He managed to get Gnr Craig his signaller out of the tank before it caught fire. Gnr Craig and the other seriously wounded were loaded into an armoured ambulance which was itself knocked out and Gunner Craig’s body has never been found. Captain Dobson, whose OP Assistant was Gnr Moore MM set off in support of the Lake Superior Regiment, an infantry unit mounted in carriers. Captain Dobson’s Sherman was described as “like a battleship among destroyers,” attracting enemy fire. His coolness under fire over two days was rewarded with a Military Cross. The 4th Canadian Armoured Division was then ordered to block the escape route of the Germans trapped in the Falaise Pocket. 107th Med Regt’s guns were brought forwards to bring fire into the pocket. On the 17th August the gun batteries came under air attack from German fighter bombers while on the move in the village of Epaney. (Stand 2 Road to Falaise Map) One of the aircraft was shot down by Gunner Farmer with a Bren gun, for which he was awarded the Military Medal, but within half an hour one gun tractor hit a landmine, killing Gnr Cornish and wounding three other men. The speed of the advance and the confused situation around the edges of the Falaise pocket brought new problems. The journey home on Sunday Morning started with an act of Remembrance at Bannerville Commonwealth War Cemetery, where several South Notts Hussars as buried. 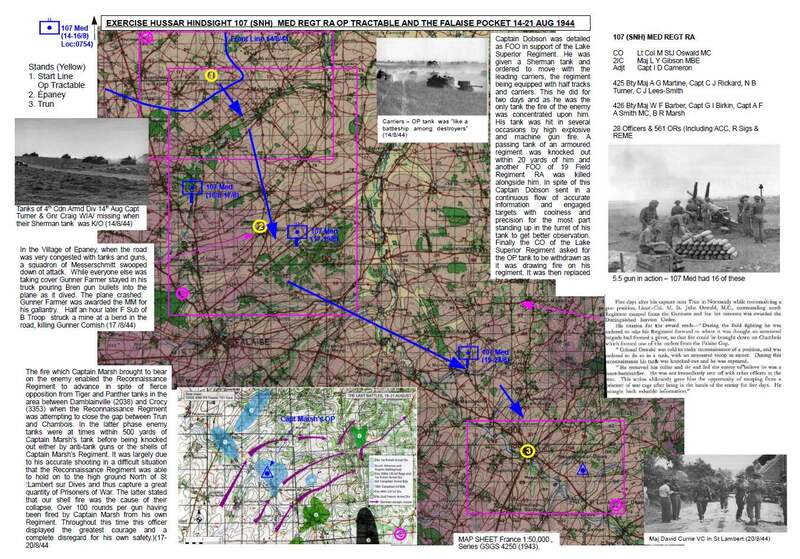 The route followed the actions fought by 150 Fd Regt in the second half of August and the beginning of September 1944. The situation on the Eastern flank changed in mid August 1944 as the German position in Normandy collapsed. At the same time as the allies executed a short envelopment of the German 7th Army at Falaise, Montgomery planned a wider encirclement, trapping the Germans outside the Falaise pocket against the river Seine. The I Corps, with 6th Airborne Division (6 AB Div) on the left flank, on the coast, would form the left wing of this advance, with the intention of linking up with the Third US Army. The 6th AB part was Operation Paddle. This operation, often overlooked in the story of the Normandy campaign took two weeks and was no walk over. The 6th Airborne Division was a lightly equipped infantry formation intended to seize and hold objectives, rather than undertake mobile mechanised operations. It lacked the communications equipment for mobile warfare and the integral artillery. For this operation 6th AB Div’s three airborne brigades were augmented by two commando brigades, a Dutch motorised Brigade and a Belgian motorised battle group. It had some armour from its own recce Regiment. The 150th SNH Fd Regt, was placed under command of 6 Airborne Division for the advance supporting different parachute, air landing and Special Service, (commando) brigades. The operation started with an attack from the positions which had been occupied for the past three months and ended on the banks of the Rover Seine. The first stage was to cross the river Dives. The battlefield was littered with minefields, marked and unmarked. Late in the evening at 11 pm. on 17 August, 1944, north west of Troarn, (Stand 2 on the Pursuit to the Seine map) a soldier from a Royal Marine Commando reported that several of his men had been blown up in an uncharted minefield and were lying wounded. On hearing this, Gunner Rawlings dashed to their rescue but while attempting to carry away one of the wounded on a stretcher was himself seriously wounded. Rawlings then gave verbal directions to the rescue parties which enabled them to pass safely through the minefield until all the injured had been brought to safety. For this action Rawlings was awarded the George Medal. Two days later, at Putot-en-Auge on 19th Aug 150 Fd were key in assisting 3rd Para Brigade to break up a German counter attack and help them to drive back the Germans capturing 160 prisoners as well anti tank and anti aircraft guns. At the next river, the Touques, 6th AB Division tried to force an attack at Pont L’Eveque. (Stand 3 on the Pursuit to the Seine Map) The fighting around Pont L’Eveque took the best part of three days from 21-24rd August. On the 22nd 5 Para Brigade attempted to force their way through with a battalion infiltrating through the town while a second battalion attacked via two fords south of the town. This assault was beaten back. On the 23rd the attack was resumed through the town and a foothold made on the eastern bank, but again forced to withdraw. Only seven men reached the objective, but were forced to withdraw. Two of these were Captain Saddleworth the FOO, who had been wounded the previous day. He was pinned down in the river itself and, while attempting to neutralise a sniper with a Tommy gun was wounded again in both hands. His OP Ack Bdr Tustin was fatally wounded in the same engagement. A second FOO, Captain Clough was wounded on the same day. The Germans brought down sufficiently heavy and accurate fire, for the actions taken by Bdr Warner the Op Signaller that day to re-establish communications between the Op and guns, to be rewarded with the MM. The last river before the Seine was the River Risle and the crossing at Pont Audemer was also heavily contested by the Germans on the 26th August. The following day 150 Fd were detached from 6AB Division which would return to the UK. 150 Fd’s next battle was the final major operation in Normandy itself, the capture of the port of Le Havre as part of Operation Astonia. The port of le Havre can be seen from the post war bridge over the Seine. 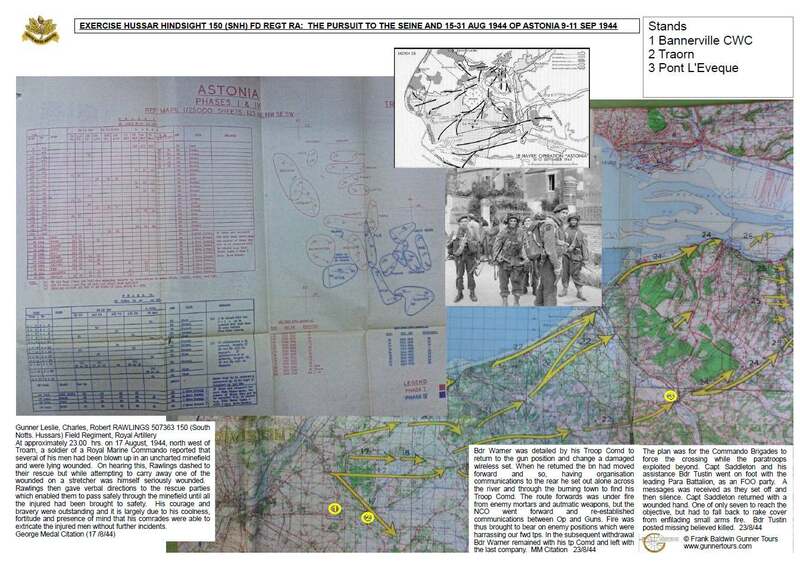 150 Fd Regt’s part in the attack is documented on the Op Astonia Fireplan schedule and trace, included on the map. “Normandy” was not an honour title for 307 Battery. The battles in Normandy did not eclipse the gallantry, and steadfastness demonstrated by its predecessor at Knightsbridge. This was a chance to see how artillery was used in different phases of war and in a mechanised and dismounted environment over different types of terrain. It was possible to tell the story from D-Day to the Falaise Gap and the Seine through the stories of members of the South Notts Hussars. The 307th Battery RA was not very different to other batteries whose lineage includes service in Normandy. The 150thFd and 107th Med Regts were not elite units. Nor had they been singled out for a special role.